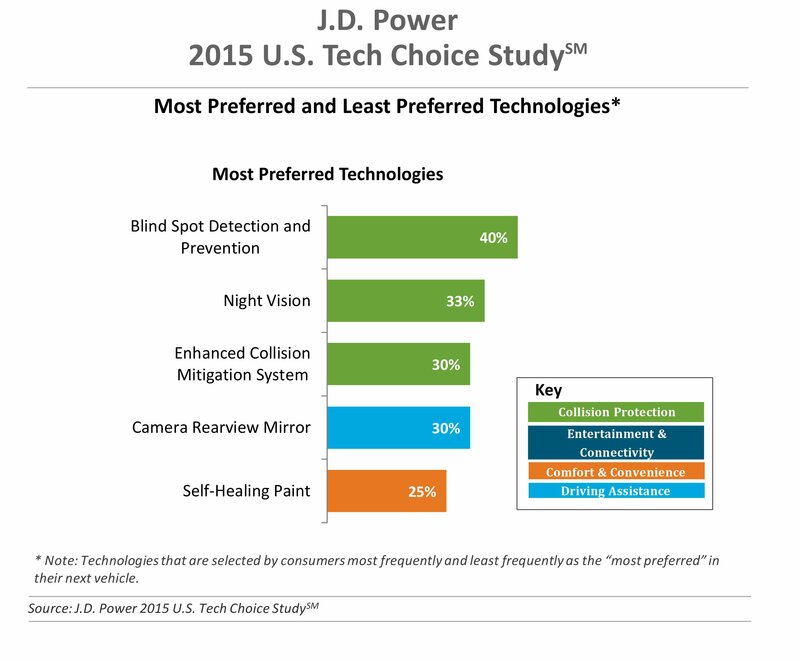 Consumers want automatic braking, blind spot checking and collision prevention, a rear-view camera instead of a mirror, self-healing paint and night vision dash displays most out of any gadgets on a vehicle, according to a new J.D. Power study, showing a demand for items with a large potential to cut into collision repair business. “The prominence of them was really quite surprising for me,” Kristin Kolodge, executive director of driver interface and HMI at J.D. Power, said of collision-related technology in an interview with Repairer Driven News. Also interesting — and counter to the stereotype of seniors snubbing new technology — is the interest in fully self-driving cars. Kolodge defined this as still involving autonomous cars, just with a “lower level of self-driving” at speeds no more than 25 mph. That’s interesting, particularly given the “traffic jam assist” term, because self-driving cars can handle low-speed gridlock well. If it cuts across all demographics, that could be the first self-driving thing to debut mainstream on cars. Also interesting was the change in views of reverse-braking. While customers had an above-average preference for technology that alerts them to objects behind them and brakes the car, they gave it less importance compared to other options in a hypothetical buying situation, according to Kolodge. Whether customers intrigued by technology will obtain it depends on cost. “Across all generations, price is the most important consideration for technology, accounting for 25.2 percent of importance,” J.D. Power said in the release. 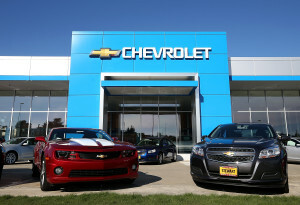 Generation Y, which along with Boomers had bought the most cars in 2015 (27.7 percent to 37.1 percent, respectively) as of the April 22 news release, will make automakers very happy. Only 19.9 percent considered technology price important and would spend an average of $3,703 on options — about $700 more than Generation X and more than $1,000 above the other two generations. “It was just curious that (the demographic) was welling to spend the most — and quite a bit more,” Kolodge said. Considering that Toyota is going to offer automatic braking in the U.S. for as low as a tenth of the total cost Generation X and Y are willing to spend and Nissan will make it standard in Japan (no word on the U.S., but we’d bet it’s coming), expect the technology to impact the level of rear-end cases you get in your shop. Plus, if these moves trigger price-cutting ones by other automakers, that leaves these customers with more money to buy more of these anti-collision technologies. Nobody really cared much about haptic touch screens, biometric sensors or gesture-controlled seats (which sound like an enormous waste of money unless there’s a James Bond ejector included), nor did they care about navigation — more bad news for the GPS systems getting pushed out by cell phone directions.